The Hubble Space Telescope’s Wide Field Camera-3 has captured this image of a giant cloud of hydrogen gas illuminated by a bright young star. The image shows how violent the end stages of the star-formation process can be, with the young object shaking up its stellar nursery. Click here for a much larger image! Despite the celestial colors of this picture, there is nothing peaceful about star forming region Sh 2-106, or S106 for short. A devilish young star, named S106 IR, lies in it and ejects material at high speed, which disrupts the gas and dust around it. The star has a mass about 15 times that of the Sun and is in the final stages of its formation. It will soon quieten down by entering the main sequence, the adult stage of stellar life. The young star also heats up the surrounding gas, making it reach temperatures of 10 000 degrees Celsius. The star’s radiation ionizes the hydrogen lobes, making them glow. The light from this glowing gas is colored blue in this image. Separating these regions of glowing gas is a cooler, thick lane of dust, appearing red in the image. This dark material almost completely hides the ionizing star from view, but the young object can still be seen peeking through the widest part of the dust lane. S106 was the 106th object to be cataloged by the astronomer Stewart Sharpless in the 1950s. It is a few thousand light-years distant in the direction of Cygnus (The Swan). The cloud itself is relatively small by the standards of star-forming regions, around 2 light-years along its longest axis. This is about half the distance between the Sun and Proxima Centauri, our nearest stellar neighbor. 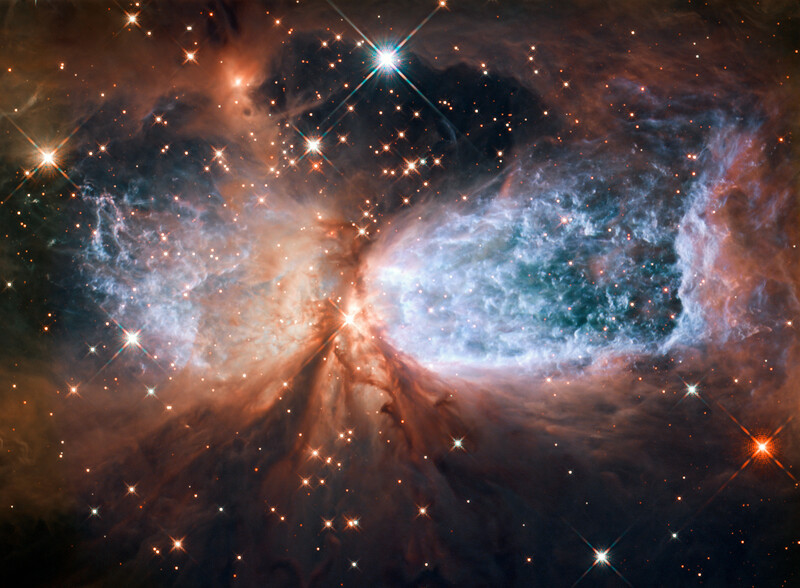 This composite picture was obtained with the Wide Field Camera 3 on the NASA/ESA Hubble Space Telescope. It results from the combination of two images taken in infrared light and one which is tuned to a specific wavelength of visible light emitted by excited hydrogen gas, known as H-alpha. This choice of wavelengths is ideal for targeting star-forming regions. The H-alpha filter isolates the light emitted from hydrogen in gas clouds while the infrared light can shine through the dust that often obscures these regions. This entry was posted in Uncategorized and tagged "hubble space telescope", astronomy, cosmology, HST, NASA, photograph, stellar birth. Bookmark the permalink.